My biggest curiosity at the time I knew that I will receive this XinLin X181 quadcopter for review, was what could it mean that it is equipped with “similar brushless motors“. 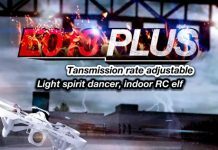 As I know, currently there are two kind of electric motors used on multi-rotors, brushed and brushless ones. While the only advantage of brushed (DC) motors is that they are cheap, the brushless ones has many other advantages like: high efficiency, high durability and low maintenance. I’m not sure if there are two versions of this X181 quad (aka Navigator X6) because on some websites it is advertised with “high hold” mode. For newbies this would be definitely a helpful feature to learn the basic flight movements without worrying about flight altitude. Certainly, the complete 5.8G FPV system and nice Walker Scout design makes this XinLin X181 a very attractive model. 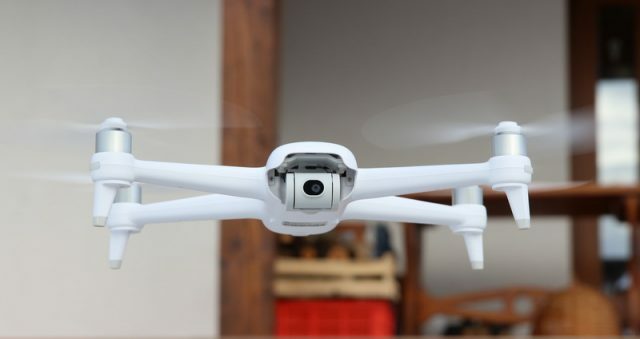 Hopefully, during my review I will reveal other positive things of this quad-copter. Trying to find out more about XinLin, which is the manufacturer of this X181 Navigator X6 quad, I came across with another model from them, the X118. This one adopts a similar FPV transmitter and it is also a design copy, looks just like a mini CX-20. Although this product was provided by Banggood for free, they didn’t requested to make my review in a specific way. Thanks again for their professional attitude. Unfortunately there was some unexpected delay receiving my package caused by the curiosity of people from customs. It looks like will be harder and harder to receive quad-copters in Europe from China. 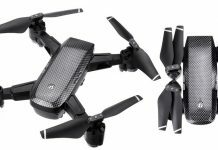 Besides the aircraft and its remote controller (with 5″ FPV screen), the package includes: flight battery, charger, 2 sets of propellers, 1 set of blade guards, 4GB micro SD card and user manual. As I mentioned at the beginning of my review, the X181 Navigator is trying to replicate the design of the professional Walker Scout quad. The engineers from XinLin added even a fake GPS antenna on the top of the aircraft to make the copy more credible. Overall the quad looks good, although it is not too sporty and is maybe a bit plump for my taste :). The build quality is decent without being used crappy plastic but, of course, it is still a toy grade drone. The impression of brushless motors are granted by some metal motor covers (caps), which beside the esthetical function in my opinion allows proper installation of the motors and also helps to dissipate the heat of the motors. The aircraft is powered by a standard 1500 Li-Po battery (7.4v – 2s) with banana plug which allows about 7-10 minutes of flight autonomy. The low battery voltage alarm will warn you when it’s time to land. On the first look I was scared about the number of control buttons, besides the usual four trim switch I counted another 12 buttons. Because not all buttons are labeled, you will need a map to find the right button :). Just joking, after few flights surely you can get used to them. In the bottom center of the remote controller is located the built-in speaker, which of course also looks like a button :). Both external antennas are fake. The real radio antenna is a piece of wire and is located inside the transmitter. In my opinion, with a simple hack by adding a 2.4Gh rubber ducky antenna, the control range can be extended up to 150 meters. You will need 6pcs of AA batteries to feed the power hungry radio. Yes, it’s not so cool. If I was one of the designers I would have opted for a 3s Li-Po. In order to prevent the unnecessary power consumption the LCD screen is not turned ON in the same time with the radio. In order to switch ON the transmitter you must push the “power” button for more than 3 seconds. 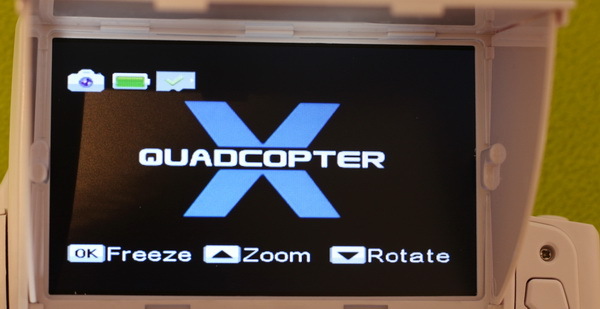 On the upper part of the transmitter is located the generous 5″ FPV screen. The included sunshade will allow more comfortable usage of the screen during sunny days. The “return to home” function can be activated with the left-top button, respectively the “headless” mode with the right-top one. Don’t look on the camera for the memory card slot because the captured files are stored on the transmitter’s SD card. 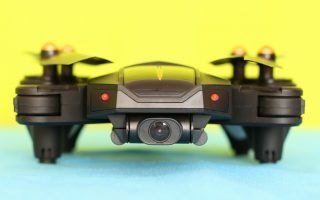 The removable FPV camera allows to “virtually” capture photos as well as videos. In my opinion, both videos and stills are saved from the live video feed. 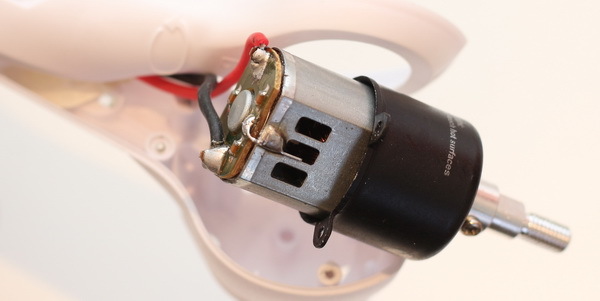 In order to allow a good FPV range, the camera is equipped with an external 5.8G cloverleaf antenna. Frankly, the direction of the antenna is not too inspired being orientated vertically instead of horizontally. The live-video feed is almost jello free and pretty enjoyable. I will try to set up a test for timing the delay of the FPV system (latency). One minutes of captured 640×480 video occupies about 70 MB on the SD card. Having large motors compared to the size of the aircraft, the X181 takes off easily. Both control and FPV ranges are at least 100 meters, which is pretty good I think. The aircraft response very well to the controls and is almost fast and agile as my JJRC X1, which has approximately the same size but is being lifted by brushless motors. However the yaw rate is not extremely fast, you will definitely have fun flying it. The FPV camera uses some standard 5.8Gh channel and can be paired with most of the 32/40CH FPV displays and goggles. If you accidentally crash landed and also lost the quad, you can preview the journey of the last flight through the playback function of the FPV transmitter right on the field in order to identify the landing zone. Using the “Set” key, the FPV display can be switched between video, photo and playback modes. BTW, being a powerful aircraft, I do not recommend for newbies to practice indoor with it. Both control and FPV range are decently usable and the flight characteristics are good. Although the brushless motors proved to be fake ones, this XinLin X181 (Navigator X6) is a nice all-in-one FPV quadcopter. Definitely some real brushless motors would make it the best drone on its price range. 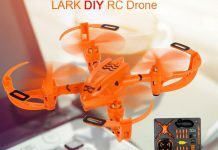 Those who are interested to test this nice all-in-one drone, it can be ordered from BG here. There you can also find most of the spare parts in case you will need some in the future. Where do i buy this XinLin X181 ?? please send the link. Nice review! What is the maximum flight time? Where can i find replacement motors? and can I get upgraded ones or even better could i install brushless to replace my broken ones?